From their press communiqué : In December 2011, four expeditioners will set off on an adventure in which the main protagonist will be the passion to change the way we do things. 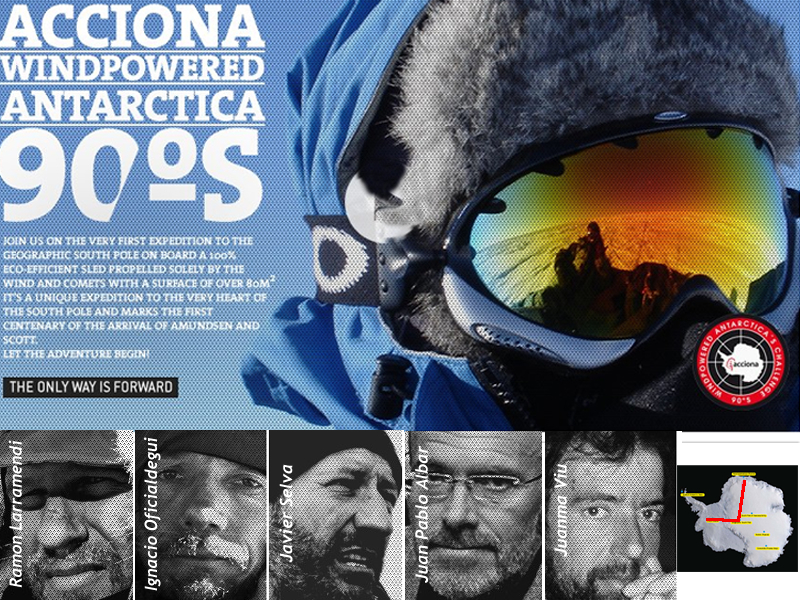 With this aim in mind, Ramón Larramendi, Ignacio Oficialdegui, Javier Selva and Juan Pablo Albar will make a 3,500 km non-stop land crossing of the Antarctic continent headed for the Geographic South Pole, unaided for 35 days. Among other scientific task on board this innovative vehicle, the sled should attempt to prove itself to be by far the best means of transport and vehicle for scientific research for the Polar Regions. The expedition should provide a unique opportunity to lay down the foundations for efficient polar research given that both Eastern Antarctica and the Inaccessible Zone are still virgin territory in scientific terms. The Polar Catamaran 2011 features a number of structural improvements. In contrast with the first catamaran used during the 2005-2006 expedition), this new version is made up of six inter-connected units made of Ultra-high-molecular-weight polyethylene (UHMWPE), making for increased flexibility and greater resistance to the freezing winds of the Antarctic wastes. The tents are bigger and feature improved inflation systems. That makes them more comfortable and habitable and increases their insulation and resistance to impact. The sleds also carry an onboard mobile laboratory with storage facilities for samples of Antarctic snow, and are equipped with solar panels that make the vehicles electric supply 100% sustainable. The vehicles for this epic expedition are fitted with bigger kites than their predecessors: up to 80m2, which provide a pulling distance of between 300 m and 500 m giving greater speed and enhanced handling capabilities. The four guys will travel non stop, day and night, with two-member shifts over 24 hours. To draw attention for the urgent need to change the way we do things -through daring and innovative approaches- that leads us to a cleaner future with an unwavering commitment to renewable energies. To be the world's first expedition team to reach the SP aboard a windpowered zero-emissions vehicle harnessing the forces of nature. To demontrate the efficiency of our vehicle and its potential for carrying out a totally eco-friendly scientific program in the least accessible parts of Antarctica. To coordinate and drive an Arctic Research Program alongside Spanish universities and researchers.